ToxExpo is the toxicology profession’s largest exposition, uniting attendees and exhibitors from around the world to exchange information on the latest products and services. More than 350 exhibitors display innovative technology and methods before more than 6,500 attendees. 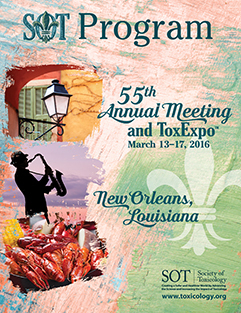 The benefits of ToxExpo extend far beyond the three-day event—resulting in beneficial partnerships for all parties. Use ToxExpo.com or the 2016 Mobile Event App (available in February) to create a list of exhibitors with whom you want to connect at ToxExpo. You can search the exhibitor listing to view detailed exhibitor information and pinpoint their location on the interactive ToxExpo map. ToxExpo.com is a resource for those who are searching for vendors who provide toxicology-related products and services. The website is a valuable tool for the buyer, policymaker, scientist, student, or anyone who is looking for the best that toxicology has to offer. Drawings will take place on Monday, Tuesday, and Wednesday in the Exhibit Hall. A $500 American Express Gift card is awarded each day. Drop your business card in the ToxExpo prize drawing boxes found in all Diamond Level Supporter booths. The goal of ToxExpo’s management team is to make sure that you make the most of your presence at the exhibition. ToxExpo is the largest event of its kind and being part of the show is only half of the solution. Marketing plans need to be well-thought out with a strategy that includes pre- and postmeeting promotions for you to reach your return on investment and drive attendees out of the aisles and into your booth. You will find an entire menu of supporting opportunities designed to assist your organization in establishing a leadership position in the 2016 exhibition. To help you get the most out of your marketing dollars, contact Laura Helm at 703.438.3115 ext. 1403. For more information on exhibiting at the largest toxicology trade show in the world, please visit ToxExpo.com, or contact Laura Helm at 703.438.3115 ext. 1403.